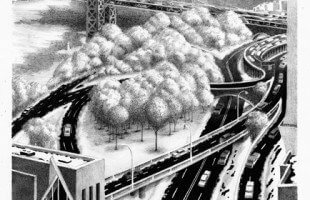 Michael Pellettieri, Many Roads to the Bridge, 2005, Lithograph, 14 7/8 x 10 7/8 inches. The League’s printmaking classes take place in spacious studios with traditional presses. Bring your ideas to class to discuss with your instructors! Students in this printmaking class (Printmaking: Etching, Lithography, Woodcut, Silkscreen) create work without using models or still life. Visit our How It Works page to learn more about League classes. Mr. Pellettieri studied at the League with Edwin Dickinson, Joseph Hirsch, Robert Beverly Hale, and Harry Sternberg. He has a B.A. in Fine Arts from the CUNY, School of Arts and Sciences, and an M.A. from Hunter College. 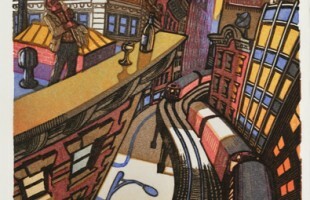 He studied printmaking at The New School with John Ross. While a League student, he won three scholarships, including a U.S. State Department Grant to study in India. 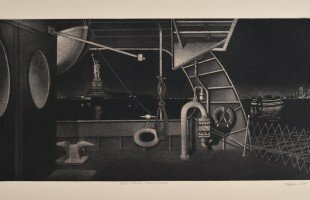 Among his awards are two from the Audubon Artists; the Strathmore Award, Boston Printmakers; a Mitchell Fund Award, 1985; a MacDowell Colony Fellowship in 1988; and the Ben and Beatrice Goldstein Foundation Award. Other awards include a Robert Conover Award in 2000 and a Burr Miller Award in 2002, both at SAGA exhibitions; and several purchase prizes, including those from the University of Mississippi and the University of North Dakota. (2005); The Old Print Shop: Prints and Watercolors (2004); the New-York Historical Society: Impressions from New York (2004); GOGA: Impressions From the League (2003); the Art Students League of New York: Retrospective, Paintings and Prints (2002); UBS Paine Webber Art Gallery: A Century on Paper; Prints by Art Students League Artists, 125th Anniversary (2002); the New-York Historical Society: Up On The Roof (2001); The Old Print Shop: Contemporary Artists (2001); and Seton Hall University: Italian-American Printmakers (2001). He was a professional consultant for, and appeared in, the film about Currier and Ives lithographs, produced by WVTA Educational Television, Vermont, in 1976. Mr. Pellettieri is represented in the collections of the Newark Art Library; the DeCordova Museum; the American Medical Association; Kidder, Peabody & Co., New York; the Ben Goldstein Collection; the Franz Greierhass Collection; Columbia Museum of Art in South Carolina; the University of North Dakota; the New York Public Library; the Dave and Reba Williams Collection; the Library of Congress; and the National Gallery.